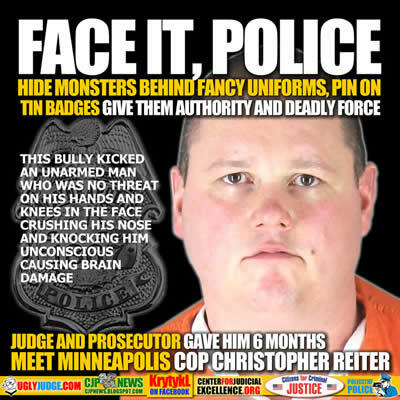 This is Minneapolis Cop Christopher Reiter, looks more like a high school loser and bully without this fancy uniform and shinny badge. What the public is not told is thousands of the problem people like =Christopher Reiter get hired each year. It’s actually not that hard to apply and get hired, with barely more than six months training they sociopaths, control freaks, people with attitude and ego issues deadly force and on top of that authority over you and your loved ones. All a lies, not only did he commit perjury and assault and got a slap on the wrist. Walking time bombs city and states have no problem hiring garbage, giving them full immunity and billing the tax payer to train them. Plus huge benefits and pensions not to forget when they kill or injure innocent people you pay the huge payouts. Not to mention the hundreds of thousands of dollars for legal defense. What’s worse is most of these monsters get paid leave vacation the moment they do wrong. No other business in the world operates this way. Yet we allow it to go on and on, with thousands of people being murdered each year. Can it be that the very people who make the laws protecting these problem cops are the ones who profit off legal proceedings and costs? Judges, prosecutors. police management and government all profit in some way from police abuse or murder. Minneapolis Police received a call from a woman reporting a domestic assault. When officers arrived at her apartment, she named Mohamed Osman as the man who attacked her. Police promptly found him sitting in a car outside, and ordered him to get out and get on the ground. He obeyed peaceably. But while Osman was down on his hands and knees, Reiter walked up and delivered a kick to his face, crushing his nose. Osman collapsed, bleeding and unconscious. He was eventually diagnosed with a traumatic brain injury. Three other Minneapolis police officers who were at the scene later confirmed that Reiter had no reason to use such force. He was charged with assault, and found guilty in October. On Tuesday afternoon when Reiter appeared back in court, he faced up near-certain jail time. The prosecution requested 180 days. Reiter’s attorney, Robert Fowler, asked the judge for mercy, comparing Reiter’s case with that of his victim, Osman.